Members of the Office of Emergency Services conduct a safety briefing prior to an exercise in Ballston Spa. NIMS is a comprehensive, national approach to incident management that is applicable at all jurisdictional levels and across functional disciplines. 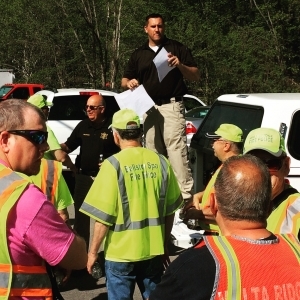 NIMS provides a consistent nationwide framework and approach to enable government at all levels (Federal, State, tribal, and local), the private sector, and nongovernmental organizations (NGOs) to work together to prepare for, prevent, respond to, recover from, and mitigate the effects of incidents regardless of the incident’s cause, size, location, or complexity. NIMS is not to be confused with Incident Command System (ICS). Although ICS is a component of NIMS, the two are not interchangeable terms. To access the FEMA Independent Study Program website, click on the link labeled NIMS / ICS Training Courses below.